When I walked out of the Rose Bowl game in Pasadena on New Year’s Day, 1959 (Iowa 38, California 12), there were newsboys at the exits hawking late edition papers with screaming headlines announcing that the revolutionary Fidel Castro had taken over Cuba, forcing the dictator Fulgencia Batista to flee. Those were the days when newspapers had late editions, and people, even on the west coast, bought them on the street. Those days are gone, and so is the enthusiasm for Castro that seemed to permeate the U.S. and Cuba as well. Bastista had been seen as corrupt and dictatorial and in the pocket of American gangsters who ran the island to maximize profits from gambling and prostitution. Americans flocked to Havana for the fun, but they knew the government was corrupt and the population hardly sharing in the prosperity of the hotels along the Malecon. Castro was a hero, a young activist who had hidden in the mountains, seen many of his co-revolutionaries slain in battles with Bastista’s troops, only to persevere and finally come down from the hills to conquer. Americans — whose own country was forged in revolution –were inspired by this act of rebellion on an island just 90 miles off the coast of Florida. He admitted his support would naturally drop as factions and ultimately parties developed. 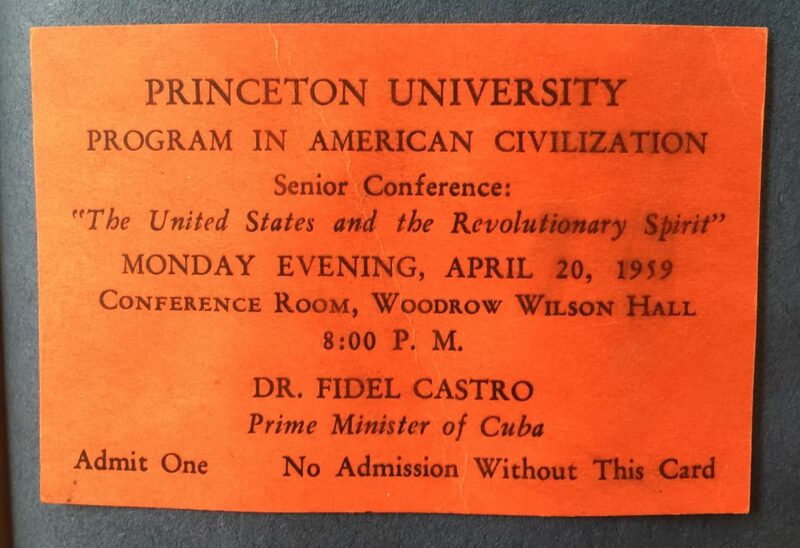 “Then Cuba will hold elections,” he promised the Princeton conference.At Princeton University, where one of the key battles of our revolution was fought and won by George Washington in 1777, Castro’s triumph almost exactly 182 years later was welcomed warmly. The Special Program in American Civilization, in which I was enrolled at the time, had as its theme that year “The United States and the Revolutionary Spirit”, and Cuba’s successful revolt fit right into our course of study. Cuba’s new prime minister seemed–at the time–to precisely embody that revolutionary spirit. He was invited to the university to speak to our conference, and when he accepted, tickets were prized, but I managed to score one. I have kept it ever since. What he said is curious, when looked at 57 years later at the time of his death, a time when Cuban Americans danced in the streets of Miami on hearing the news. 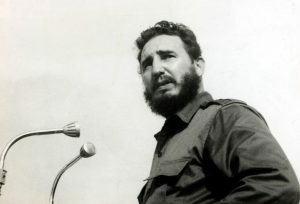 “Ninety-four percent of the Cuban population was and still is in favor of the revolution,” he declared, “despite the fact that there was not widespread starvation in Cuba.” That popular support was the reason his “26th of July Movement” could defy predictions and overcome Bastista’s modern army. But he admitted his support would naturally drop as factions and ultimately parties developed. “Then Cuba will hold elections,” he promised the Princeton conference. The promise of democracy in Cuba didn’t happen; the leader, who five months later told a meeting at the United Nations in New York that he was not a communist, declared in late 1961 he was a “Marxist-Leninist.” Relations between the U.S. and Castro’s Cuba deteriorated very quickly, as he eliminated opposition by firing squad and American companies by nationalization. Thousands of Cubans left the country. The ideals of equality, free elections, and the end of the aristocracy gave way to a totalitarian state where prosperity was elusive, despite free health care and a better education system. In America, the great popular enthusiasm that had greeted his New Year’s Day victory waned. More than half a century after his joyous, optimistic trip to Princeton, free elections and free speech remain unfulfilled promises. Still, the spirit of his revolution-–the overthrow of a corrupt dictatorship, the promise of a better, more egalitarian life–continues to inspire some Americans who look to their own revolutionary roots and see a more successful parallel.